Students who appered Eamcet 2 and the parents of Eamcet 2 is saying as Sathwik first secured 108th rank in AP Eamcet, 96th in T Eamcet 1 and 170th in T Eamcet 2. Koushik's hard work paid off with 53rd rank in AP Eamcet, 8th and 158th in T Eamcet 1 and 2 respectively. For Shiva Kumar, the respective ranks were 9th, 43rd and 19th. "My son Shiva Kumar's ranks in three Eamcets did not surprise me as he has been a consistent performer in academics all along, securing over 98% marks in Intermediate and 10/10 in SSC," said D Prabhakar, a teacher at Suryapet in Nalgonda. While vowing to fight any attempt to impose a re-exam in the wake of the T Eamcet-2 paper leak, he pleaded with the state government not to make meritorious students pay the price for fraud committed by a few. "I burnt the midnight oil to achieve top ranks. Now, I am totally confused," said Shiva Kumar, a student of Sri Chaitanya Junior College in Banglaguda in the city. T Prakash Rao, a resident of Warangal and father of T Koushik, in fact, put the blame on the government for the predicament faced by his son, also from Sr Chaitanya Junior College in Bandlaguda. "Had the Telangana government gone ahead without postponing the first Eamcet-1, scheduled on May 2, the paper leak incident might not have happened in the first place. I will not accept if my son is punished for no fault," said Rao, unwilling to accept a fresh exam at any cost. 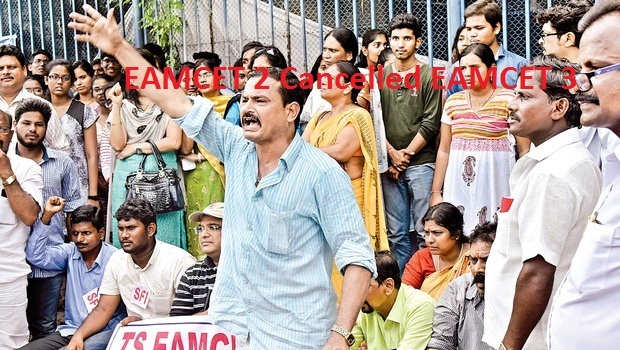 As per CID Two persons named Venkat Rao and Ramesh, brokers of Hyderabad based education consultancies were interrogated on the allegations of contacting with many students before EAMCET-II, offering them the leaked question paper. The CID officials had the cell phone call recordings of some students which contained the conversation between the brokers and the parents regarding the question paper leak.